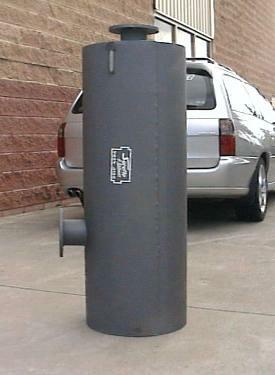 We have custom mufflers in Mild Steel and Stainless Steel for special applications. They are made from 1.6mm sheet steel with TIG welded seams. These mufflers are nearly bullet proof and are particularly suited to 4x4, Rotor and Turbo applications. The thick steel gives the mufflers a very deep note which make V6's sound like V8's. 4x4 heavy duty off road mufflers. More Ground Clearance & virtually indestructable. Rotor & Turbo applications - Stainless Steel packing for high temperatures. 6 cylinder Sports systems that sound like V8's. . .
Forklifts, Front End Loaders, Tractors, Trucks - cheap alternative to genuine parts. Cars & Vans that burst open the seams of normal mufflers from backfires. These mufflers are virtually indestructable. Our Custom Polished Stainless Steel mufflers can be made in any body size, length and configuration. They can be used in all applications from Show Quality down to just long life applications for any vehicle.